The divergence is the difference between the return obtained by the investors in a DARWIN, and the theorical return of a DARWIN. It is shown as a percentage and its value can be either negative or positive. From a technological standpoint, it is impossible to replicate the traders' and investors' trades identically, therefore there will always be some divergence. When the investor's Wallet currency differs from the DARWIN's base currency, there can be small differences in the value of trades, due to the value of both currencies whilst the trade remains open. Their long term development is random, therefore trades can have both positive and negative divergence due to base currency. Due to technological reasons, the investors' trades are always replicated with a delay of a few seconds compared with those of the traders and, in that brief space of time, the market conditions can alter, and as such the price at which the trades are executed. As before, the divergence's development is random. This is the main cause of systematic divergence. It happens when the capital under management in a DARWIN important enough than when it tries to execute a large volume trade, this causes slippage in the market price, offering an execution price to investors worse than that obtained by the trader. Under the same conditions, the higher the volume invested in a DARWIN, the higher the negative impact will be on the divergence. In the following point we will see the estimated value of this divergence, whose information you can find in the DARWIN's page. How can we analyse the divergence? In the DARWIN's ''Investor's'' tab, you will see a graph with a simulation which compares the % return that would have been obtained by the supposed investors compared with the DARWIN, for the specified time period, and taking into account the current monthly divergence. Remember that, this estimate is only calculated on the divergence caused by the volume of investors. It's easy to see how, no matter how small the negative divergence, it ends up having a big importance in the long term. Also in the ''Investors'' tab, there is a graph with dots in different colours and sizes, which represent the orders executed for investors. 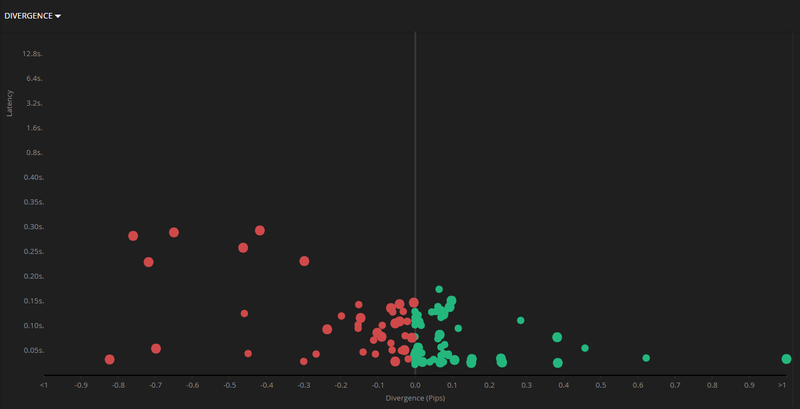 The vertical axis represents the latency in milliseconds, and the horizontal axis shows the divergence in Pips (red dot = negative divergence; green dot = positive divergence). Here we can see the difference in execution between the trader and the investors over a maximum of the last 100 orders. 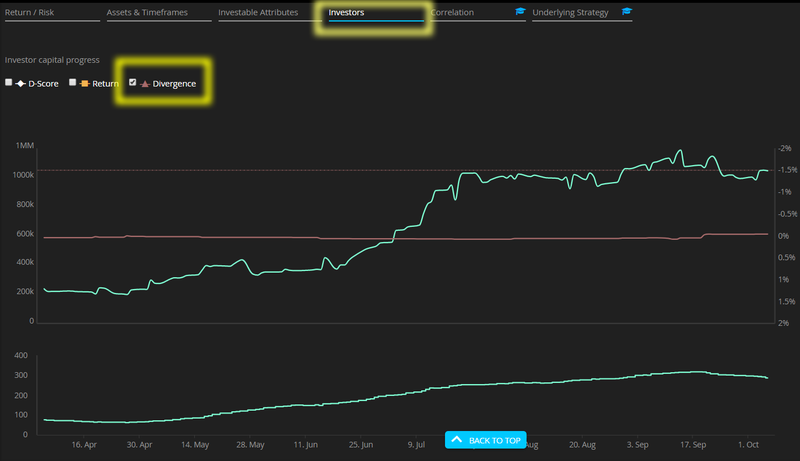 Furthermore, from the information shown in the "Investors" tab on the DARWIN's page, you can see the latest calculation of the estimated monthly divergence caused by the volume of investors taking into account the most recent orders. As mentioned, the monthly divergence we display takes into account the last 100 orders of investors, and from those 100, only the orders that get executed with a moderate latency, i.e. in less than 400 ms or average latency if average latency is higher than 400 ms.
For example, at some point we had to close DARWIN PME because, despite its history of negative divergence, there was a brief period during which its divergence became positive. Many investors dared to invest in it until, on one unfortunate day, they suffered a massive negative divergence. From the DARWIN's Terminal, in the ''Invested DARWINs' tab, you will be able to see the live accumluated divergence that you have in each of the DARWINs you have invested in. You only have to go to the ''Divergence'' column. A divergence of 0.39 % means that the return of your investment in this DARWIN is 0.39 % higher than the notional return of the DARWIN since you invested in it. You can calculate the notional return of the DARWIN dividing the DARWIN's current quote by the average quote at which you bought the DARWIN. The difference between this return and your actual return is your investor divergence. When it comes to analysing DARWINs, we recommend you bear these tips in mind. No matter how small it may be, it will accumulate over time, and could end up being very significant if you stay invested in a DARWIN over a large period of time. If you invest in DARWINs with a base currency different to yours, you must take into account that, the longer the traders' trades last, the more likely you are to see significant divergence due to base currency. But you must also bear in mind that if you you stay invested for a relatively long period of time in that DARWIN, due to its random behaiour, the divergence tends to balance itself out. Divergence can only be calculated for DARWIN that already have investors which have sent at least 10 orders. We consider that divergence with a latency less than 400 miliseconds has been caused by investor volume. Therefore, orders with a latency above 400 ms are not taken into account when calculating the monthly divergence. If the divergence is the result of high latency, over 400 milliseconds, we consider that this is down to technological causes, which could be a delay in confirming the order executed by the trader on behalf of our Liquidity Providers. This could be during important new releases with a noticeable increase in volatility or during market rollover when liquidity is scarce. This result is largely random and sometimes will go in your favour, and other times against you, therefore the effect balances itself out over time in the long run.